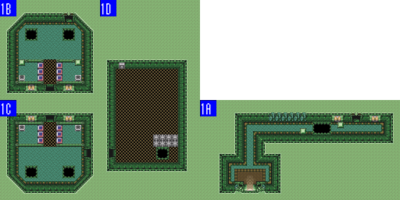 Like the area surrounding the Ice Palace, this area was also changed drastically by Ganon's magic. While adventurers once had to cross what was known as the Desert of the Golden Land, they later found themselves in a stormy swamp, filled with creatures that would rise from the muck. 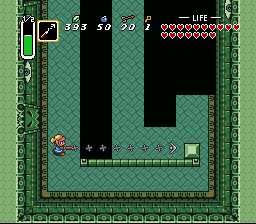 On the map of the Dark World, you can see a large swamp in the southwest corner of the land, but there doesn't seem to be any way to reach it. The canyon just to the east of Misery Mire ends in cliffs that block off the swamp. The answer has to be in the Light World. If you search the desert for a Warp Tile that might lead to the swamp, you will only find what you are looking for on the Duck's landing spot number six. Lift the right stone to reveal the warp to Misery Mire. In order to keep the waters of the swamp from spilling out into the Plains of Ruin, Ganon blocked the passages between the two areas with high bluffs. The only way to enter this area is through a Warp Tile in the Light World. In the northwest, near the palace, adventurers can find two important caves. 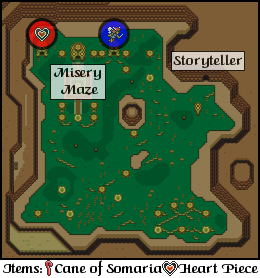 There are two caves in the vicinity of Misery Maze. 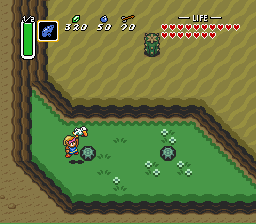 The cave to the west contains two Treasure Chests and several blocks. An intelligent explorer should figure out just exactly how to push the blocks in order to get to the Treasure Chests. While one of the chests holds Rupees, the other one holds a Piece of Heart. The cave which is located east of the Misery Mire entrance is a good place for explorers to rest and tend to their wounds. By drinking from the Faerie Fountain inside, they will be rejuvenated and able to continue their journey. It is a convenient location for such a place. An odd creature in the cave on the northeast edge of the swamp tells passersby about the entrance to Misery Maze. He says that only someone with control over the elements can enter the dungeon. 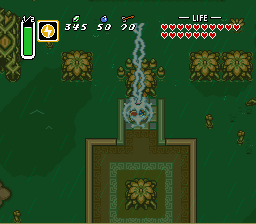 Such controls is said to be possible through the use of the Ether Medallion. An alcove has formed in the upper right corner of Misery Mire. This alcove corresponds to an unreachable cliff in the Light World. By standing deep inside the alcove and using the Magic Mirror to warp back to the light world, you will reach a stairwell that leads inside the cliff, where you will find another Piece of Heart. The labyrinth under Misery Mire is sealed by the same magic that created the wind and the rain in the swamp. As long as the rain clouds hover over Misery Mire, the entrance to Misery Maze will remain sealed. The tile near the dungeon's entrance bears the same lightning bolt symbol as the Ether Medallion. While standing on that symbol, call upon the magic of the Ether Medallion, causing the clouds to vanish and the dungeon entrance to rise from the swamp. 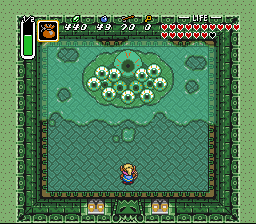 In addition to being guarded by five yellow Zols, the entrance to Misery Maze is designed to prevent those without a Hookshot from gaining access to the rest of the dungeon. Fire your Hookshot at the block across from the gap to access the stairwell to the first basement level 2A below; or, jump across by standing between the gap and the block, and dashing toward the block. You will find two torches here, positioned behind a set of stones. Four Wizzrobes will warp into the room to attack. Push past them to visit room 1C below. This room appears as the vertical mirror image of room 1B above. Now two torches are positioned at the top of the room. Your ultimate destination lies to the right, in room 1D. When you first arrive in this room, it will be very narrow and lack anything interesting to examine except for a single telepathy stone. By investigating the stone, you will be told that you need to light four torches to proceed. Interestingly enough, you just passed four torches. Return to rooms 1B and 1C. Make sure all of the Wizzrobes have been cleared out before you proceed. Among the set of three blocks that prevent you from accessing each of the torches, push the top and bottom blocks forward, and push the remaining center block up or down. When you have access to all four torches, proceed to light each one with the Fire Rod as quickly as you can. It does not matter that you have to cross a doorway to light them, they will remain lit for the normal duration. If you manage to get all four lit, you will hear a substantial rumbling sound. Return to room 1D to investigate, and you will notice that the right wall has regressed and a hole in the floor has been exposed. Hop into the hole to access room 2H one floor below. When you arrive on the floor, you will be greeted by two Popos. Further investigation will reveal more Popos in the room, along with a sentry statue and a brand new enemy: the Wizzrobes. Wizzrobes warp into a room, just long enough to attack you with their magic, and warp back out. You must destroy every enemy to open the door above and proceed to room 2B. You will visit and revisit this large room and its many pathways throughout your visit in the Misery Maze. 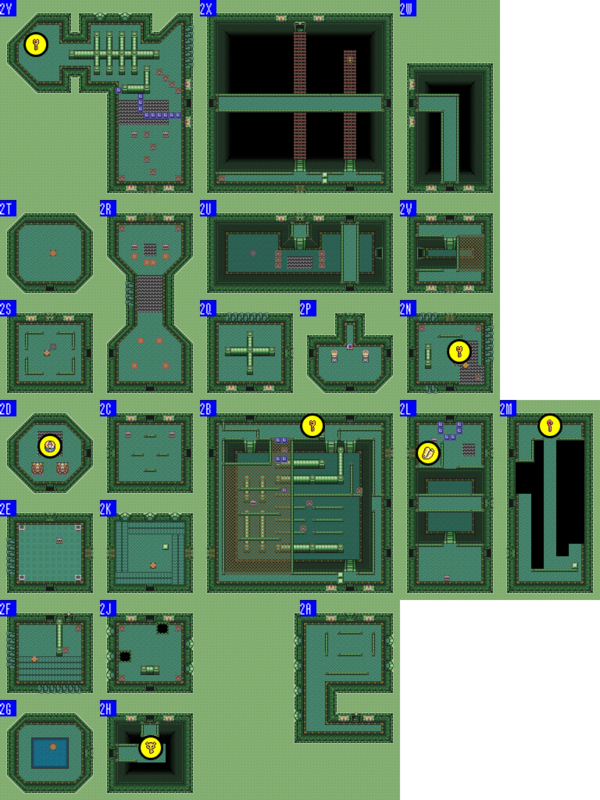 Nearly every door is accessible from another entrance one way or another, with one exception; the pathway in the upper left corner, along with the nearby switch hidden under a skull, may be blocked off by blue fence blocks. You'll need to find the remotely-positioned Crystal Switch to make this section accessible. For your first visit through this room, it is wise to head to the upper right open door which leads to room 2P. When you return here the second time from room 2C to the left, walk down along the side of the room, and back up along the grating that straddles the lower level of the floor. With the blue fence blocks lowered, you have access to the switch hidden beneath the skull. Step on the switch and open the treasure chest that appears in order to find a Small Key. Then proceed up through the door immediately to your left to room 2Q. After collecting the Small Key from room 2X, climb down the ladder, and simply run all the way left and climb up the next ladder that you come to. Run down the left side of the wall, and unlock the door on the bottom left to room 2K. When you return to this room after having collected the Big Key, it's time to unlock the door along the top portion of the right wall, and enter room 2L. If you are following along with the walkthrough, you will enter this room for the very first time from room 2R above. For now, simply return to room 2B on the right. The treasure chest in this room is only accessible, like many parts of this dungeon, if the blue fence blocks are lowered. Provided that they are, you can open the chest and claim the Compass. Return to room 2E below and enter bottom door to room 2F. When you enter this room, the tiles will begin to lift off the floor and attack you. To make matters worse, there's a fireball trap as well. There are four torches in the room, and even if you wait until every last tile attacks, the shutter door at the top of the room will not open unless you light all four torches. If you get them all lit, the door to room 2D will open, where you can grab the compass. Ultimately, you must pass through the door below to room 2F. A number of enemies and a trap occupy the room that contains conveyor belts along the very bottom. Do your best to dodge and attack them safely and cross around to the stairwell on the other side of the top wall to reach room 1B. Make sure you remove the skull before the door and collect the full magic refill. Standing on the warp tile in this room sends you to the arrival warp tile in room 2S. If you arrived at this room from the room to the north, you will be placed on a balcony from which you can only view the treasure chest, but not access it. The only way to access it is by falling from room 1D up above. If you land in front of the chest, open it up and collect the Big Key. Once you have it, the only way out is through the left to room 2G, so head through and take the warp you find there. There is little to no reason to enter this room. It contains two sentry statues and a Taratal slug. The door below leads to a useless dead end. There are a number of pesky enemies in this room, including two floating Stalfos skulls, a blue Bari, a fireball trap, a Bubble, and a Crystal Switch. Defeat the two skulls, and destroy the Bari to collect a Small Key. Proceed through the locked door on the left and enter room 2E. If you arrive at this room by unlocking the top door along the right wall of room 2B, you'll end up next to the treasure chest that contains the dungeon Map. The blue fence blocks should be lowered, so you can reach the other side of the partition and drop down to the lower portion of the room, and pass underneath the bridge and climb the ladder on the opposite side. Head through the door on the right, and enter room 2M. As soon as you arrive in this room from the lower door, have your Hookshot ready and quickly fire over to the block on your right. You must do this because the bridge will begin to collapse shortly after you arrive, and if you try to run over without using the Hookshot, it will be difficult to make it in time. As soon as you arrive, begin dashing along the bridge before the bottom collapses. You should make it just in time, and arrive at the large treasure chest of the dungeon. Open it up and claim the magical Cane of Somaria. Once you have the Cane, you must return to room 2S by way of 2L, 2B, 2C, and 2R. It's rare to find a single room in a dungeon that can provide you with two keys. This is one such room. There is a Small Key under the skull in the upper left corner. Grabbing it is easier than avoiding the attacks of the three red Stalfos and sentry statue that also occupy the room. Take your time and make the effort to destroy all of the Stalfos. When you are done, you will notice a skull in the lower right corner of the room, surrounded by spikes. You can don the Magic Cape if you have it to avoid taking damage, but reach the switch regardless to make a treasure chest appear. Unfortunately, the chest will also be positioned on the spikes. Open it to receive yet another Small Key. With your newfound surplus of keys, unlock the door to the north and enter room 2V. Two Popos stand guard in a room with a movable block, and four doorways. If you've just arrived here for the first time from room 2B, then ignore all other aspects of the room, and enter room 2N to the right. During your second visit to this room from 2Q, push the block that prevents access to the top door to one side, causing the door to open. Walk up through the door 2U. This room has a large cross partition throughout the room, and is occupied by a bunch of slug-looking enemies named Taratals. They lay bombs behind them, so be aware of when their bombs are about to explode. Defeat all of the Taratals and proceed through the door on the right back to room 2P. If you are following along with the walkthrough, you will enter this room for the very first time from room 2Y above, after just having hit the Crystal Switch, changing it from orange to blue. This means the orange blocks will be raised, affording you a small amount of defense from the various traps in the room. You need to make it to the bottom of the room, which means crossing a long, dangerous set of spikes on the floor. Possession of the Magic Cape is invaluable in this case. Otherwise, you are bound to take a good deal of damage. There is a large spike trap waiting for you in the bottom half, but it is considerably easier to avoid. Head down through the bottom door, to room 2C. If you first arrived in this room by taking the warp tile immediately after collecting the Big Key, you'll notice the door that can only be unlocked with the Big Key. Remember this room because you will need to return here before long. For now, return to room 2B by passing through 2R and 2C to get there. You will return here once you possess the Cane. Open the door to the north, and enter room 2T. Standing on the warp tile in this room sends you to the arrival warp tile in room 2U. During your first visit to this room, you will be arriving along the top level bridge from room 2P below. Cross the bridge to reach the right portion of room 2X. After you've obtained the Cane and warped into this room from room 2T, be prepared to deal with the two Bubbles and the Wizzrobe present in the room. The Bubbles present a good opportunity for health if you are quick with the Magic Powder. There are also two "Bunny Beam" traps under the lowest skulls. Climb up the ladder and open the Big Key door, and return to room 2X. When you first arrive in this room, it will only benefit you to walk across the grated bridge and enter the door above to room 2W. It will do you no good to visit through the lower door on the left until you have collected the Big Key. This room merely serves as a connection between room 2V and the upper level of room 2X. When entering this room from room 2W, you will find that all you can do is run across the bridge over to room 2Y. The next time you arrive will be from the upper level of room 2U which deposits you on the right side of the room. Climb down the ladder there and run along the bridge to the very end where you will find a chest that contains a Small Key. Then run all the way back down to room 2B. Once you enter the room through the Big Key locked door in room 2U, head all the way to the left and find the full magic refill before running along the center bridge to the stairwell at the opposite end. You will arrive at room 3A. This complicated room is in the shape of the number seven. There are large collections of wall partitions with fireballs that cling to the walls and follow the outer perimeter. From the right door, follow the room up and to the left. Avoid making contact with the fireball, and run all the way to the left. You will find two pleasant surprises; the Crystal Switch, and a Small Key hidden under the nearby skull. Hit the crystal switch so that the blue fence blocks are lowered throughout the dungeon. Now you can proceed around through the lower portion of the dungeon. Make your way to the locked door below. You will have to contend with a Wizzrobe and two red Stalfos. In addition to the fireball traps, there is a "Bunny Beam" trap hidden underneath one of the skulls. Unlock the door below to room 2R. You will arrive in this room in total darkness with only your lamp to help guide you. Don't bother looking for any torches to light as there aren't any. 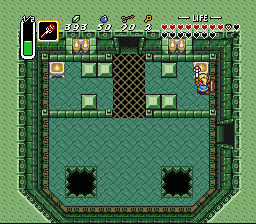 Proceed to the lower right corner and unlock the door to room 3B to collect some Rupees if you are in need of any. Then search the right side of the room for a skull that hides a pressure plate beneath it. Obviously with pressure plates, standing on them is not enough to keep a shutter door open. But a thorough examination of the room will reveal no statues that you can use to keep the plate pressed. As it happens, you now possess the tool which will serve the same function as a statue. The Cane of Somaria can create blocks. Use the Cane to create a block and position it on top of the plate, and behold, the shutter door will remain open. Pass through it to enter room 3C. Enter this room to collect 9 blue Rupees. Two blue Stalfos and a Bubble occupy this dark room. An exit to the left leads to room 3D. This room is divided into two parts. You will enter through the lower part. At this point in the game, the Crystal Switch is set to blue, so orange blocks are raised. That will be a problem in room 3F, so we need to hit the switch at the top part of the room. Avoid the spike trap in the bottom portion of the room, and navigate the maze to reach the left side. Then you can walk to the top portion where you can fling a boomerang at the Crystal Switch to change its state. There is no need to deal with any more of the top half of the room unless you are desperate for Rupees, and you can run back down to head through the lower door to room 3F. If you are, you must navigate the conveyor belts along the outer edge of the top portion of the room while fireball traps fire at you. Once you traverse the belts in a counter-clockwise direction and reach the left wall, drop a bomb to create an access to the upper portion of 3E. Once you're done, return to this room and continue on to 3F. The top portion of this room simply houses another Crystal Switch which you will need to hit in order to proceed through the left door in room 3F. The lower portion of the room can only be accessed by bombing the wall in the top half of room 3D. A fireball trap and a Bubble guard 18 blue Rupees. If the Crystal Switches of the dungeon are not set to orange, you will not be able to progress through this room. Once the orange fence blocks are lowered, you can get as far as the blue fence blocks on the opposite side, but no further. You need to find a way to lower the blue blocks without passing back through the right door. If you examine the top wall, you will notice that the wall is cracked and can be bombed. Blow a hole through the wall to discover the Crystal Switch in room 3E. Hit it and return to this room to proceed through the left door, but be prepared to deal with the two Bubbles that are free to roam the rest of the room. Enter room 3G to continue. This room is primarily filled with traps, including "Bunny Beams", fireball traps, spike traps, and Bubbles. Zols fall from the ceiling to attack. You may be tempted to rush straight up the stairs, but you'll find it difficult to proceed if the orange fence blocks are still raised. Much to your benefit, there is one last Crystal Switch above the stairwell. Make sure you hit it and change the switch to orange before proceeding up the stairs to room 3H above. You will see a fire chain Winder wrapping around the room when you arrive. As long as the orange blocks are lowered, you will be able to pass through the passage on the left to room 3J. A Bubble may creep over from this room over to room 3H as you approach. You will find the door to boss along the top wall. Vitreous' core is a giant eyeball, but he sends several small eyeballs to attack you. You can destroy them simply by swinging your sword at them, as they won't put up much of a fight. As you begin to destroy the smaller eyeballs, fewer eyeballs remain to weigh the core down. As a result, he will sometimes rise out of the ooze he rests in to fire a giant lightning bolt attack at you. Once all of the small eyeballs have been defeated, Vitreous will have no other choice than to attack you directly with the core eyeball. It will bounce towards you. Keep swinging your sword non-stop, as it is really the only way to defend yourself, and Vitreous will eventually die, leaving behind a precious Heart Container. Collect it, and the sixth Maiden crystal will descend for you to collect. The sixth maiden lets you know precisely why Ganon used the wizard Agahnim to capture the seven maidens and send them into the Dark World, where they were imprisoned in magic crystals and distributed among Ganon's generals. 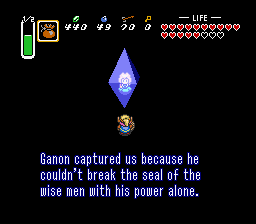 Only one crystal remains in Ganon's possession and it's the crystal occupied by Zelda herself. You must hurry to Turtle Rock and find the way to rescue her. This page was last edited on 28 October 2014, at 21:11. This page has been accessed 114,880 times.